Super chic & my little dog loves it too! This cozy, soft and stylish sheepskin shag rug offers luxurious ultra-soft comfort and easy-to-design styling. Made from an authentic sheepskin hide, this playful decor is a welcome addition to any room. I love this little rug! It is real sheepskin, and it's delightfully soft! I'm using it in the bathroom, and it softens up the bathroom so well. I adore this rug. So do my kids who wish the flooring in our house was covered with it. Love it. Recommend it. I would not use it as a blanket, but it would look nice draped over a chair for decoration purposes. But once I decided it would be used as a rug, it will remain as a rug. Shape as pictured is exactly as it arrives. Color is more ivory, but I like that. It's authentic. If it was too white it would appear faux, which this rug is not. I bought this to lay over a chair, so my opinion is not based on actual floor use. Having said that, it is exactly what I wanted and has been really great. My only warning would be in how the rug was packaged. It came rolled in plastic and taped closed. I cut into the package and accidentally cut a small part of the the rug....it was totally my fault, I should have looked closer. Just be careful when opening! This sheepskin wool white shag rug is absolutely beautiful. I have even washed it with great results. I love the softness, color, and touchability. Having had a sheepskin rug that someone bought me from Australia, I was looking forward to having one on each side of my bed, in a newly renovated bedroom. These rugs were a poor example of sheepskin rugs. Although the label states 100% Sheepskin, it was doubtful. The hide (leather) backing was paper thin, so thin that in some spots there were holes through to the fur. 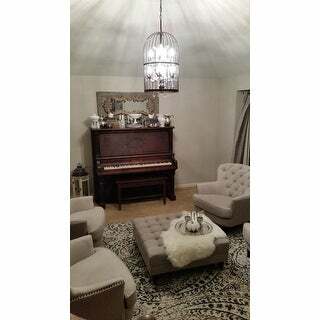 The fur and hide were bleached to an unnatural white making the rug look fake and cheap. The fur was also falling off around the edges and when given a little shake, fur started flying. I returned them! Love the idea of sheepskin rug; love the brand; love O.com; HATE the smell of this rug. Came wrapped/rolled tightly in heavy duty plastic. The smell was so strong even when wrapped that it offended when it was in the car for 30 seconds (the time it took to get it out of the mailbox and drive it down to the house. I cut it open and the smell was like rotten eggs. I used to drive past a deer hide tanning factory in the Midwest. This smell is the chemical used in tanning leather--sulfuric acid compound. I hung the sheepskin rug outside to "air out". Three days later, the odor had dissipated enough to bring the rug in the house. It further "de-gassed" over the next week. Now, a month later, the smell can be detected if the skin side is held up close to the nose. It may fade away completely--eventually. I did not return the rug. I expected the smell would fade with time and it has. HOWEVER, I think that Savavieh needs to have better QC wherever their facility is that produces these hide rugs (China?). The smell at first was really atrocious. I have no way to know if this experience was a freak occurrance. The fur side, itself, is beautiful and soft with natural shading of creams, whites and subtle tans with the overall look from a distance being white. I currently have it on the foot of a bed in the guest room. The rug has degassed enough to not leave a scent in the room. I would consider ordering another rug in the future--because the look can't be imitated with a fake fur replica. I accept that the tanning of animal hides can cause an odor that will dissipate with time. I use this rug as a throw piece for the foot of my bed, and it is wonderful! Other reviews mention a smell to the rug, which I did notice when I first opened the rug, but went away after a day. If I press my nose down into the rug, I can still barely smell the treatment smell, but this should not deter you from purchasing, since it is not noticeable without REALLY trying to get a whiff of it. The rug is more of a yellowish tone, but this is due to it's natural color, making it look more authentic versus a cheap imitator. Extremely thick and soft, and absolutely beautiful. Totally delighted with my recent purchase of the natural pelt sheepskin rug. It is just the right size for throwing over the back or arm of a chair or over coffee table. The color is a beautiful natural cream color and it is so soft to touch. Love it. I also purchased (2) of the 2'x6' size for each side of my bed. Beautiful. Nice quality sheepskin rug. As advertised. You should expect slightly varying shapes, as in any natural product. 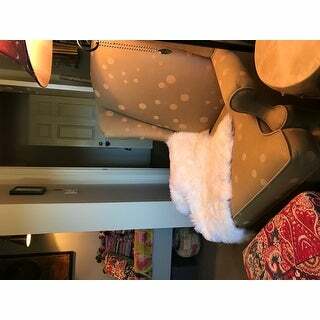 This cute little Safavieh prairie natural pelted sheepskin wool white rugs are so cute! Super soft, can’t wait to drape them over my dining chairs. Ok when I first got this it had a very funky smell to it. After letting it air out a few days and a nice rub down with some fabric softner and it was perfect. I'm not using it as rug but as a bit of texture and protection for my chair. Just what I needed & so soft I can't stop petting it! Ordered this rug after seeing the great price and great reviews. Saw a few reviews that said the rug smelled a bit but figured I could deal with a little smell for a day or two. When the rug arrived it was as promised (definitely not white more tan) but the smell that came from it was awful. Very intense chemical smell. I sprayed the rug, aired it out for a few days, washed it. The smell has gotten better but almost a month later is still present. It makes me wonder how safe it is to have something with such a chemical smell in my home. I would return it if I could but its been too long now. I would recommend another rug, even though this one is beautiful and comfy just due to the smell. I bought this to swag on my ottoman and it is perfect. It isn't that "muppet" type fur and is soft. Mine does not get walked on, just looked at so for those purposes i am certain this will last. This item is advertised as a natural sheepskin pelt. It is not it is man made in China. Very disappointed in the product. I purchased this rug to go under my desk in my basement office. I thought it would be a cozy, soft way to keep my feet warm when the basement is on the colder side during winter. Soon after putting this rug in my office, I thought maybe we had some kind of water leak in our basement. There was a bad, almost sour smell. I decided maybe the rug was absorbing scents, so I moved it into a corner of our basement playroom instead. My office smelled fine and I didn't think too much of it. Then a couple weeks went by, and I noticed a bad, sour smell when I was sitting near the sheepskin rug in our playroom. I smelled the rug itself, and it was so gross that I tossed it out in disgust. I definitely do NOT recommend this item and will not be purchasing anything labeled as a "natural pelt sheepskin" rug again. Don't waste your money on this thing. These rugs are a great size for a "quick" winter decorating bit. Nice. Soft and luxurious. Had a faint 'rotten egg' odor that dissipated within an hour or so of opening the package. I can't decide whether to drape it over a chair or use it as a rug.. maybe I need to buy another one. It's OK. Kinda generic. It has a very pre-made feel and look to it. The hide is thin, the fluff ok, but the cookie-cutter look is the most disappointing. I'd send back, but return shipping is ***. So it's mine now. Beautiful, soft, and the right size. Even though the rug smelled a bit, I figured it would fade once out of the bag. I had to return it because the color was not white but more of a lemon yellow tint. The quality was not bad at all. Beautiful and soft, looks great! It's a nice looking sheepskin, but I learned the hard way that it can't be exposed to sun through a window. It turned yellow! I've never had this happen to other sheepskins. So, it's nice as long as you're not going to use it in a sunny spot. I ordered 2 of these that both smell so badly I won’t be able to use them. They are also much more yellow than pictured. It came with a note saying they would need time to air out but it’s been weeks. "How to care for the sheepskin rug, do you need a comb or anything to keep up the perfect appearance of the rug. Thanks"
I have had one of these for years and I only vacuum it. If it ever got dirty where it needs cleaning I would use the same stuff I use for my wool sweaters " Eucalan Fine Fabric Wash". It contains lanolin, it's got natural softners and you don't rinse it. This rug is really just wool and as long as you gently wash by hand with lanolin for the leather it will be fine. Love , love these rugs! "Is the shape of the rug, the first picture shown?" The rug I received is the shape of the second image. Yeah i bought 2. Its a natural sheepskin pelt so its the shape of a natural hide. My rugs are in shape of first picture. I love mine and get lots of compliments. I have 3. "How is this rug cleaned?" I have it in a low traffic area, so it hasn't gotten dirty. This rug is so soft, that it's nice to locate it where you will be barefoot. With sheepskin rugs I've owned in the past, I have spot cleaned. I once washed one in the bathtub, and the leather got very stiff...won't do that again. "What shape will I recieve? I noticed there are 2 different shapes "
This photo seems odd for the 2x3 rug - I've bought the 2x3 and it's perfect for my powder room but it's definitely not the rug pictured. I've also bought a few 2x6 versions from them (think of this one pictured but split down the middle) and it's fabulous for my master bath and guest baths since it comfortable spans even a double sink. I think they've just got the photo wrong. These products are phenomenal and I'm a huge fan of Safavieh. Of note, these rugs are thick. So don't put them anywhere near a door that needs to open over them. The backings are wonderfully soft and the rugs are very pliable if you wanted to drape them over a chair or other piece of furniture. I agree with the answer already posted. Your pix seems to be two skins not the single that the 2X3 is. I love it as does my dog who sometimes walks around the house with it! Great price! "Could you drape this over a oak wood chair in the dining room or is the backing too stiff? I'd like to use it as a throw. Will that work? Thanks"
You could easily drape this over the back of a chair. the backing is soft enough to let the rug hang and drape like you would want it to. Yes, definitely! 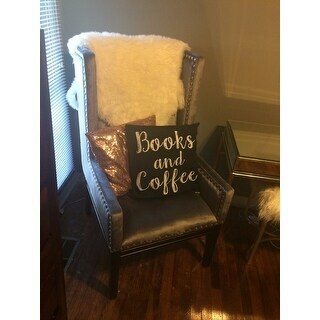 I have one draped over the back of a wing back chair and one over a round ottoman that I use as a coffee table. They give such texture and dimension....love mine! I think you can. I am using mine on a desk chair, and it drapes just fine. "How high is the rug on average. Need to know for fitting under a door. Thanks"
THE RUG WILL NOT FIT UNDER A DOOR .... I USE THEM IN MY BEDROOM AND BATHROOM . Will not fit under a door. We use it as a throw on a living room chair, or on the bench at the dining room table. Gorgeous!